From the perspective of the young Lakers core - guys who had never heard their names in serious trade rumors before, let alone at the insane volume that came with the Anthony Davis talks - it had to be disturbing. The team was willing to trade them in a heartbeat. Did LeBron James want them traded? You could tell it got in their head during the 42-point beat down earlier in the week in Indiana. Can the young Lakers put this behind them and make a playoff push behind a finally-healthy LeBron? 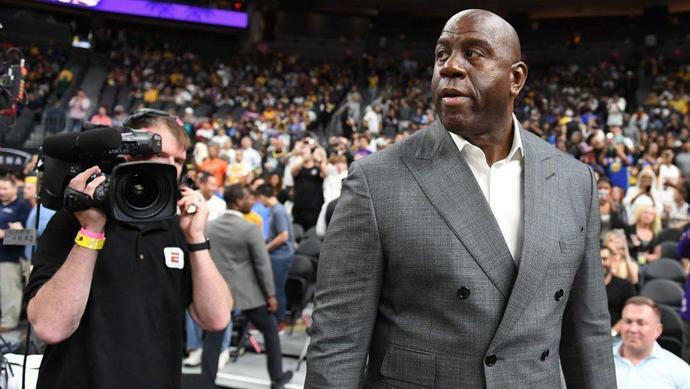 Thursday night's win in Boston was a good sign, but to clear everything up Lakers' president Magic Johnson is going to meet with the players, reports Broderick Turner of the Los Angeles Times. The Lakers should be the favorite to climb over the Clippers and back into the playoffs in the West - and maybe get all the way up to the seven seed, hoping to avoid the Golden State side of the bracket - now that LeBron is back. The Clippers likely take a step back without Tobias Harris (although not as big a one as some think), but also in that mix is the upstart Kings (ahead of the Lakers by half a game) who upgraded at the deadline with Harrison Barnes. Still, the Lakers with LeBron were solidly in the playoffs before his groin injury and the win in Boston shows how they can climb back up the ladder. That said, the Lakers have a much tougher remaining schedule than the teams they are chasing. They can't afford to stumble for 10 games as guys sulk about the trade rumors then try to dig out of the hole they created, and Magic knows it. The impact of team meetings like this tend to be overrated, but it's easy to understand what Magic is thinking and hoping for with this get together.